You’ll want the ‘mm%’, the metadata missed percent, to reach 0. So when the ‘arcsz’ column is no longer growing and you still have high values for ‘mm%’, that means the ARC is too small. Increase the value of ‘zfs_arc_max’ and continue to monitor. If the 1GB of ARC for 1TB of data ratio is good for large ZFS recordsize, it is likely too small for a recordsize of 16KB. Does 8x more leaf pages automatically require 8x more ARC space for the non-leaf pages? Although likely, let’s verify. The last section of the above output is very interesting as it shows the B-tree pages. The ZFSB-tree of the file sbtest1.ibd has four levels. L3 is the root page, L2 is the first level (from the top) pages, L1 are the second level pages, and L0 are the leaf pages. The metadata is essentially L3 + L2 + L1. When you change the recordsize property of a ZFS filesystem, you affect only the size of the leaf pages. The non-leaf page size is always 16KB (4000L) and they are always compressed on disk with lzop (If I read correctly). In the ARC, these pages are stored uncompressed so they use 16KB of memory each. The fanout of a ZFS B-tree, the largest possible ratio of a number of pages between levels, is 128. With the above output, we can easily calculate the required size of metadata we would need to cache all the non-leaf pages in the ARC. So, each of the 330 tables of the dataset has 1160 non-leaf pages and 145447 leaf pages; a ratio very close to the prediction of 0.8%. For the complete dataset of 749GB, we would need the ARC to be, at a minimum, 6GB to fully cache all the metadata pages. Of course, there is some overhead to add. In my experiments, I found I needed to add about 15% for ARC overhead in order to have no metadata reads at all. The real minimum for the ARC size I should have used is almost 7GB. Of course, an ARC of 7GB on a server with 15GB of Ram is not small. Is there a way to do otherwise? The first option we have is to use a larger InnoDB page size, as allowed by MySQL 5.7. Instead of the regular Innodb page size of 16KB, if you use a page size of 32KB with a matching ZFS recordsize, you will cut the ARC size requirement by half, to 0.4% of the uncompressed size. Similarly, an Innodb page size of 64KB with similar ZFS recordsize would further reduce the ARC size requirement to 0.2%. That approach works best when the dataset is highly compressible. I’ll blog more about the use of larger InnoDB pages with ZFS in a near future. If the use of larger InnoDB page sizes is not a viable option for you, you still have the option of using the ZFS L2ARC feature to save on the required memory. Now, the comparison is very different. 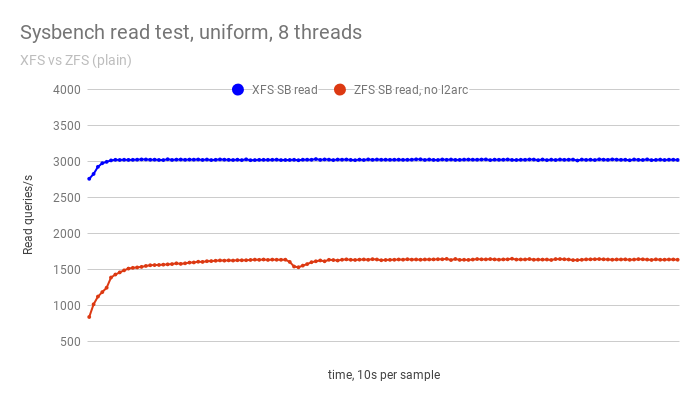 ZFS completely outperforms XFS, 5000 qps for ZFS versus 3000 for XFS. The ZFS results could have been even higher but the two vCPUs of the instance were clearly the bottleneck. Properly configured, ZFS can be pretty fast. 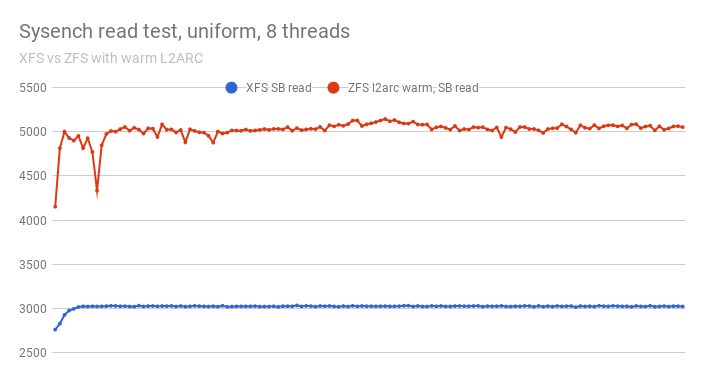 Of course, I could use flashcache or bcache with XFS and improve the XFS results but these technologies are way more exotic than the ZFS L2ARC. Also, only the L2ARC stores data in a compressed form, maximizing the use of the NVMe device. Compression also lowers the size requirement and cost for the gp2 disk. The post About ZFS Performance appeared first on Percona Database Performance Blog.